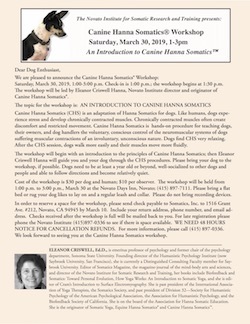 Announcing: AN INTRODUCTION TO CANINE HANNA SOMATICS® workshop with Eleanor Criswell Hanna, Novato Institute director and originator of Canine Hanna Somatics. Saturday, March 30, 2019, 1:00-3:00 p.m. Check-in is 1:00 p.m.; the workshop begins at 1:30 p.m, held at the Novato Days Inn. Workshop fee is $30.00 per person & dog; $10.00 per person for observation only (no dog). Canine Hanna Somatics (CHS) is an adaptation of Hanna Somatics for dogs. 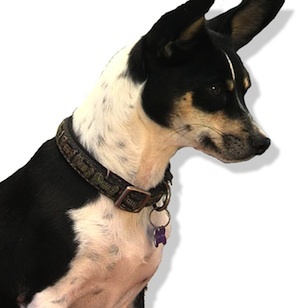 The workshop will begin with an introduction to the principles of Canine Hanna Somatics; then Eleanor Criswell Hanna will guide you and your dog through the CHS procedures. Please bring your dog to the workshop, if possible. Space reservation deadline is March 10. For more information, please call (415) 897-0336. Canine Hanna Somatics® with Eleanor Criswell Hanna, Ed.D., in conversation with veterinarian Edward Biery, DVM, and "how-to" demonstrations with dogs Annabelle and Isana.) 90-min., color DVD. Canine Hanna Somatics® (CHS) is an adaptation of Hanna Somatics for dogs. Like humans, dogs experience stress and develop chronically contracted muscles. Canine Hanna Somatics® is a hands-on procedure for dog owners that uses the principles of Hanna Somatic Education® for use with dogs to facilitate greater ease of movement and overall mobility while strengthening the bond between dog and human.